University and high school percussion ensembles waged a friendly war in downtown Indianapolis, Friday, Nov. 15, during the inaugural DrumLine Battle competition held as part of the Percussive Arts Society International Convention (PASIC). DrumLine Battle® is one of Drum Corps International's newest performance initiatives that gives drum lines of any age between two and 30 members the ability to face off head-to-head. The Indiana Convention Center served as the "battleground" at PASIC, which annually marks the world's largest festival of all things percussion. The four-day convention features a series of more than 120 concerts, educational clinics, master classes and more. The performing groups at PASIC represented a diverse cross-section of institutions from Big Ten drum lines from Indiana University and the University of Michigan, to groups like Tennessee State University who represents one of the more than 100 historically black colleges and universities in the U.S. "DrumLine Battle created a big buzz at PASIC among fans, participants and corporate sponsors," said DCI Director of Business Development John DeNovi who has been instrumental in getting DrumLine Battle off the ground since its unveiling last winter. "The program is gaining a lot of traction and continues to grow. We're excited about the direction we're headed." Drum lines competed in front of a packed crowd at PASIC in a bracket style tournament, with the top advancing high school group going up against the top college group in the final round of the event. Judges included DCI Hall of Fame member Scott Johnson and University of Texas at Austin percussion director Thomas Burritt. The panel huddled after each set of performances to make on-the-spot decisions determining who exhibited the most entertaining 90- to 120-second routine and out-battled their opponents. 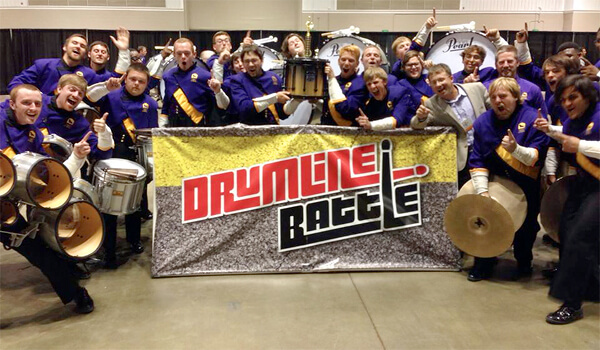 The University of North Alabama drum line was named the 2013 DrumLine Battle Champion at PASIC in November. Advancing through four rounds of competition, the University of North Alabama (UNA) was named the first-ever PASIC DrumLine Battle Champion. UNA snare drummer Matthew Upton said that his group put in an extra 30 to 40 minutes on top of their daily after-school rehearsals during the fall to prepare for the DrumLine Battle at PASIC. "[DrumLine Battle] was definitely something that was new to us, but it was definitely worth the time and extra practice we put into it," Upton said. 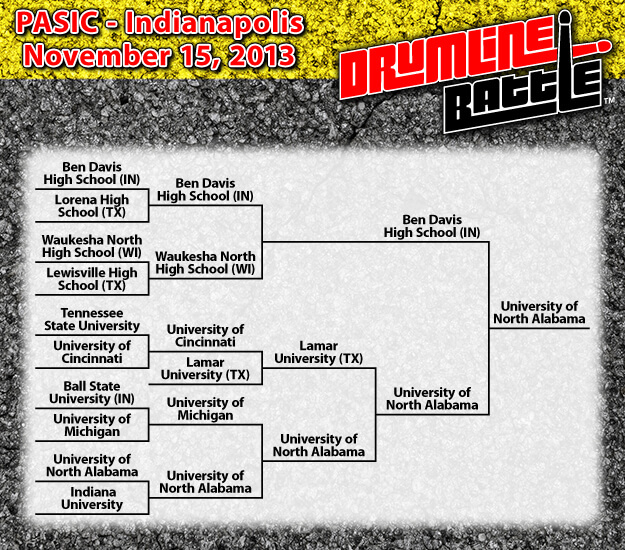 Results from the PASIC DrumLine Battle in Indianapolis.